The clock passed midnight as I came to the realization that I was still over 2 hours away from my destination, Mexico Beach, Florida. I would be getting little sleep before my 5AM wakeup call for the Beach Blast Olympic distance triathlon. As I drove down the lonely, dark Florida highway somewhere between the interstate and Panama City I noticed that the only light over the dark, flat terrain was coming from my headlights. The stars were out in full force and I had to contain my excitement as I watched at least 3 shooting stars burn across the sky because everyone, other than me, was sound asleep. So you get a wish when you see a shooting star right? Well what did I wish for? It has something to do with an island state of the United States that's somewhere in the South Pacific. We arrived at the hotel around 1:45AM. At the suggestion of a good friend of mine, Llew Hughes, I booked a room at the El Governor hotel. El Governor is a neat little joint with rooms that back up right to the beach. We had an amazing view of the GUlf right off our balcony. As I type this report, I'm sitting on that balcony on Sunday morning, drinking a cup of coffee, listening to the waves crash against the beach. After unpacking, I laid down but I would get no sleep. A combination of the pre-race excitement and the caffine from the coffee on the ride up kept me tossing and turning. 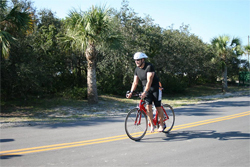 This would be my 17th triathlon of the year but it would be my first in the Gulf of Mexico unless you consider Lonestar in the GUlf which I do not. Lonestar was in a bay and the waves were minimal. This would be full on waves. They wouldn't be BIG waves but they would be waves nonetheless. 5AM slowly arrived and even though I got the alert from my watch I was already wide awake. I did a last minute check of my bike and my gear, slipped on my swim gear and my bike shorts and then watched Beth try to rouse the cranky kids. While I know they enjoy the trips we've been taking I can guarantee that they HATE the early wake up calls. We arrived at the race site just after transition opened. My first question to the race volunteer received an answer that I Wasn't wanting to hear. The water temperature was 81 degrees so wetsuits would not be allowed. After getting body marked and picking up my race packet I wheeled my bike into transition. This race was open transition so I picked a spot as close to the bike exit as I could. 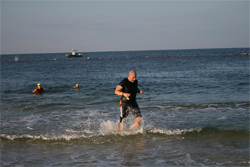 After a quick warm-up run the race director announced that it was time to head to the beach to start the swim. I was excited that I would get to do a running start from the beach to the water. Every other open water start was deep water which you were already in the drink when the horn sounded. I was in the first wave at 7AM. The race director went over final instructions then blew the horn. I sprinted the 20 yards to the water and high stepped my way to a depth where I could dive in. That ended up being my first of many mistakes of the day. As my goggles hit the water I broke the seal and ended up with a face and eyes full of saltwater. I was never able to fully seal the mask for the entire swim. It seemed like each time I tried to seal it I would only end up making it worse. We had to do two laps of the 750m course so I figured that when I started my second lap I would clear the mask in the chest deep water. Having saltwater in my eyes made navigating difficult but that was nothing compared to the new element of swimming the waves. In all my races and training I'm used to swimming on the X plane. Throwing a little Y plane into that equation made things all the more difficult. Swimming the waves wasn't harder, just a little more disorienting and it definitely made it harder to see the buoys. I was able to clear my goggles when I started the second lap but it really didn't matter because the damage was done. My eyes were salt-waterlogged and would remain so for the next day. I exited the water after 30 minutes and ran up the beach towards T1 on the other side of the highway. T1 was smooth. I didn't lollygag and since I wore my bike shorts to swim I had 1 less item to put on. On with the glasses, on with the helmet, on with my shoes and I was off. I had plenty of time to make up for my poor swim. Once again, as in many of my other races this year, I wasn't passed even once. I passed a good 30 people on the course which was for the most part flat with the exception of a huge bridge that crossed one of the intracoastal waterways. I wouldn't find out until after the race that I learned that I was penalized for "positioning". I find that somewhat hard to believe since I never was passesd nor did anyone even attempt to pass me. I saw the USAT official riding on the back of a Harley give me the evil eye and write in her little book at one point on the couse and for the life of me I don't understand what I was doign wrong. At the point when she passed me there wasn't a bike 200m in front or behind me. I guess she considered me blocking her motorcycle from passing or something. Who knows!? My penalty didn't make even a tiny bit of difference on the overall outcome of the race but it sure made me feel all "gangstah" and "thug life" for breakin' the rule. I maintained a 23 mph average according to my bike computer but the official results, with the penalty, will surely knock that down a bit. I guess I was around a mile from T2 when I stood up on the pedals to increase my speed and yelped out in pain as my right calf locked up and started to spasm. I've never had any problems with muscle cramps during training or in races but today would be that exception. I executed a flying dismount into T2 and jogged my bike to my area. I quickly transitioned to my running gear and limped out of T2. Thankfully the pain was short lived because it quickly subsided within the first mile of running. The run course ran down Highway 98 and through a couple of subdivisions. There were no hills to speak of and the weather at this point of the day was just downright pleasant with a slight breeze and the temperature hovering just over 80 degrees. There were plenty of turns onto various streets that made up the 6.2 mile course. Having my wonderful luck I ended up turning down a wrong street and in the blink of an eye I ended up running an extra 1.5 miles. MY run course was just under 8 miles instead of the 10K I was supposed to be running. I wish the extra mileage would have been the end of my difficulty for the day but unfortunately it wasn't. At around mile 2 I had my wonderful gastric explosion emergencies. I chuckled to myself as I darted off into the woods... or rather I darted off into the sparse weeds. I didn't have to sacrifice my socks because I no longer wear socks when I run. They slow me down in transition so I ditched them. Wet wipes and MRE napkins packed away in my race bag had to suffice. T3 took 15, aggravating minutes. I stumbled out of the bushes, got back on course and continued on my way to the finish. Shortly after I reached the turn around point and started to feel a sharp pain in my side. The sharp pain ended up being a big sticker bush limb that I picked up in T3 that somehow wedged itself in my compression shorts. That must have been a sight to the runners behind me as I was digging in my shorts pulling out sticks. I finished my run with no more incidents and crossed the finish line in just over 3:02. Add my 2 minute penalty and my total time was around 3:05. It was by far not my best effort by any means but it was racing so that's better than not racing. Next up is the Walk from Obesity 5K on October 5th, the Crab Trap Triathlon in Destin on October 11th and then the USAT National Championship series Pumpkinman in Vegas on the 18th. 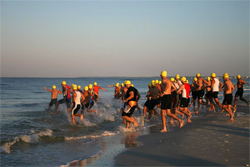 I hope you enjoyed reading my account of the 2008 Beach Blast Triathlon as much as I enjoyed writing (and living) it.